A small (270m) strategically-located mountain on the Kyoto/Osaka border, over which a decisive battle was fought in 1582 between Toyotomi Hideyoshi (who won) and Akechi Mitsuhide (the battle of Yamazaki). Thus, commanding position or strategic point. By extension, a battle over such a position or competition to occupy it first. A high, commanding point critical to both sides, with the potential to decide the direction of the game. Often, a board-dominating point at the boundary of opposing moyos, or boshi-like move. Often occurs near the end of the fuseki or the beginning of the middle game. Merely being big or strategic does not suffice to make a move or point tennozan. Decisive game. In a seven-game series tied 2-2, the fifth game is crucial. It will place one player just one win away from victory; the other player just one loss away from defeat (kadoban). The winning player will have a "commanding position" in the series. Thus, such a game is also called tennozan. tennōzan wo nogosu na, literally keep your eye out for the pivotal situation in the game, or don't miss the chance to take the point which expands your moyo while reducing your opponent's. Example 1 says "Black 49 is tennouzan." It's a boshi, attacking the white group and enlarging upper-right moyo. From http://www.sankei.co.jp/edit/igo/html/juudan/02judan/2_04.html, which says, "Black should have decisively taken the tennouzan point." Example 3. Says "For 25 the tennouzan was 27." The move indicated is a knight's move at the boundary of two moyos. Example 4 Discusses a book (by Haruyama Isamu 9-dan) with a chapter called Moyo no tennouzan, focusing on tennouzan as points where moyos come into conflict. From the 51st Oza title match, game 5. According to the commentary, the large knight's move of is the tennozan related to the expansion or reduction of both players' moyos, and must not be overlooked. From http://hobby.nikkei.co.jp/igo/oza/50_1_3/05.html. The comment is "Black grabs the chance to jump to the Tennozan point and take the lead." 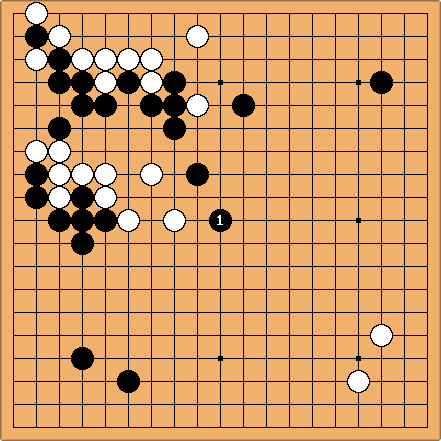 Position from game between Go Seigen, taking three stones, and Honinbo Shusai, Jan. 1-19, 1930. In his commentary in Go Seigen's book Saishin Uchigo Kenkyuu, vol. 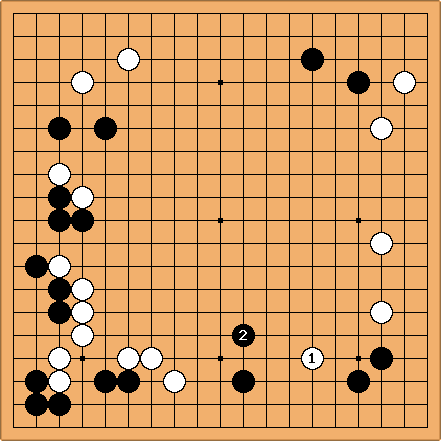 II, p. 109, Go notes, "a (the move played in the game) should have been at , a point worthy of the name tennozan (tennouzan tomo iu beki tokoro)." 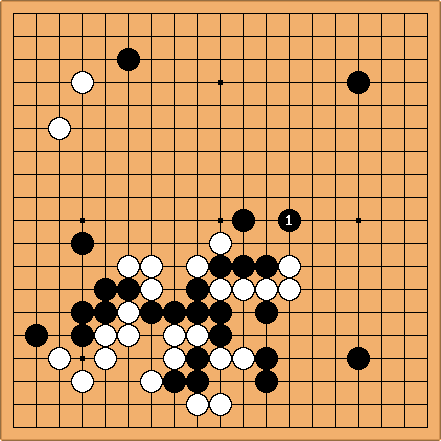 Concerning this game, Go relates: "This was a three-stone game played against Shusai Meijin under a 2-3-2 handicap. Mistakenly believing it was instead 2-2-3, I placed two stones on the board, only to be gruffly told by Shusai Meijin, 'mittsu (three)'. I recall how I instantly tensed up." 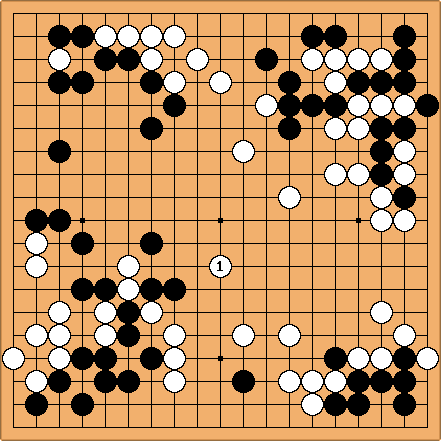 Although not a particularly good game for Go, he did end up winning by 11 points. With move white soberly protects the corner. Black's jump at , is played on the point that determines the growth of each player's influence and at the same time the reduction of other player's; this point is absolutely Tennozan. By contrast, Jin Zhixi turns a blind eye to this urgent point. It is truly difficult to understand why he would allow his opponent to play there. 白22继续守角，是在冷静。黑23跳,这里关系到双方的校长,绝对的天王山.金志锡对比要点居然视而不见,实在让人费解. -- Weiqi Tiandi 15 July 2011 issue, page 58. White resigned after 119 moves. Full game record. 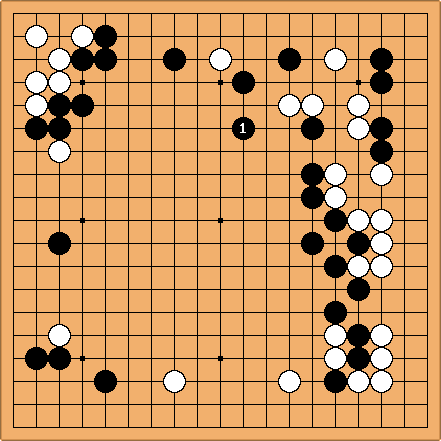 Oblique historical connection with go: the victor at the historical battle of Tennozan was Hideyoshi who defeated Akechi Mitsuhide, having chased after him when he (Mitsuhide) killed Oda Nobunaga? on the night of the alleged triple ko game with Honinbo Sansa. Other usages: Shogi (there is a proverb that the centre square is the Tennozan); sports (decisive match). Authors: Bob Myers, John F, Bill Spight, others.